You can’t buy the greatest book ever written (my old mum aways said “If you don’t blow your own trumpet no one else will.” Keep in mind this is the same woman who used to lock us kids under the stairs during a thunderstorm, so she’s not completely logical!) anymore because it’s completely and utterly SOLD OUT. It’s proven rather successful over the past 4 years and I couldn’t be prouder on how it’s gone and helped a ton of people. “I don’t know what we would have done without your kit. It has saved us making many mistakes and has helped us grow immensely. “First off, I’d like to say a million thank-you’s to you for the Web Design Business Kit. In the last 8 months since its purchase, my business has taken off like crazy. I’ve got 11 contractors signed with me, I’ve hired a bookkeeper, and a part time project manager/marketing person. That last one may be made up, and it may have been made up by me. The rest are all true and genuine. I have to say it’s fantastic to get so much positive feedback – I’ve received hundreds and hundreds of the same sort of kind words and, funnily enough, I never get sick of reading them! Yeah I did notice that, I’ve been waiting a few months now for my order.. print faster! I have to agree with the quotes. It is a remarkable book. P.S I do fancy you. And hi Uma. Just send a photo so I know it’s you. I’m sure it is you. It is you, isn’t it Uma? Please let it be you! I couldn’t let this opportunity go by to chip in my words of gratitude! I once bought the WDBK and thought it was tremendous. Pretty soon I too was bringing in the bigger value sales by following the advice and the approach recommended in the book. I then wrote to Brendon to thank him and soon realised that he’s a guy with a lot of time for people like me and a generosity just as huge as the double volume WDBK! 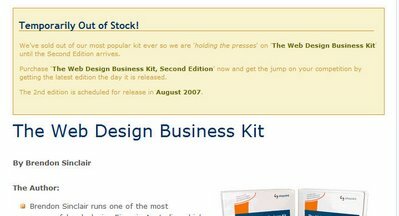 If you’re in web design, and you haven’t bought the kit, then get over to Sitepoint and get on the back order list now! You won’t regret it. Thanks again Brendon for the WDBK and for everything since. I’m also a great fan of it, and have since passed it onto my salesman to read as essential reading to take in.